Topics: Videos, and Peter Hollens. 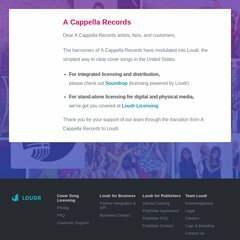 acappellarecords.com A Cappella Groups - Discover A Cappella Choirs and Singers on A ..
acappellarecords.com A Cappella Albums - Discover digital A Cappella music on A .. The site has about 91 users daily, viewing on average 2.40 pages each. Acappellarecords.com's server IP number is 66.147.244.64. It has 4 nameservers, including ns1.name.com, ns2.name.com, and ns4.name.com. Bluehost Inc (Utah, Provo) is the location of the Apache server.